Wash and soak toor dal for 10-15 minutes. Boil 2 glass of water and add toor dal. Pressure cook it for 3 whistles. Let it cool. Blend dal with a blender till it is totally smooth. Soak peanuts in water for 10-15 minutes. 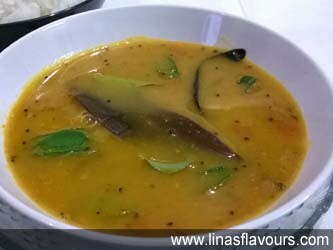 Take a pan, add dal, peanuts, salt, turmeric powder, red chilly powder, coriander cumin powder, jaggery, tomatoes, green chillies, ginger paste and boil it. If it is too thick then add 1 cup of water and boil it. Take another pan and heat oil. Add mustard seeds and let it crackle. Add fenugreek seeds, cumin seeds, and let it crackle too. Add cloves, cinnamon, dry red chillies, bay leaf, curry leaves and in the end asafoetida. Add this to dal and let it simmer for about 5-7 minutes. Garnish it with coriander leaves and serve it with rice.